The UK based online retailer, Device Wire is now offering an unlocked version of HTC Touch Pro2 smartphone. The QWERY phone has been improved with a new worry-free interface that makes multi-party calling as easy as tapping on contacts. The high speed HSDPA connection has been improved and the messaging functionality has also been enhanced. 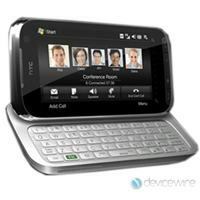 Along with a 3.6-inch touch screen with 480 x 800 resolutions, HTC Touch Pro2 is also equipped with a 3.2-megapixel camera with auto-focus function. It powered by Qualcomm’s 528MHz CPU, running on Windows Mobile 6.1 Professional, supports quad-band GPRS and Wi-Fi, has integrated a GPS sensor, and built-in FM tuner with RDS. In addition, it is Bluetooth enabled, support microSDHC memory card and, comes with 1500mAh battery that provides up to 454 hours of standby time and 419 minutes of talk time. The HTC Touch Pro 2 has a dimension of 4.57 X 2.33 X 0.68 inches and weighs 175 grams, and is priced at £509.99 with tax included.